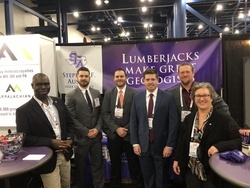 Stephen F. Austin State University geology students and faculty members attended the North American Prospect Exhibition Summit in Houston, the world's largest oil and gas prospect expo. From Left: Dr. Wesley Brown, professor and chair; Richard Irwin, graduate student; Cole Hatcher, graduate student; Tyler Tandy, graduate student; Dr. Kevin Stafford, associate professor; and Dr. Melinda Faulkner, assistant professor. NACOGDOCHES, Texas - Several graduate students and faculty members from Stephen F. Austin State University's Department of Geology recently attended the North American Prospect Exhibition Summit in Houston. The annual event provides oil and gas professionals the opportunity to network and market industry advances. "As the world's largest oil and gas prospect expo, the annual NAPE Summit is a unique opportunity for faculty to network with industry professionals and reconnect with many geology alumni, which helps faculty evaluate the current and evolving needs for preparing students for future careers in the energy industry," said Dr. Wesley Brown, professor and chair of the Department of Geology.